Thank you, Zoe, for giving us this topic to blog about because dreams are lovely! Don’t listen to people that tell you to ‘get your head out of the clouds’ (most people to me most of my childhood), we all need some time up there. A little escapism is a pleasure, not a guilty pleasure. And there’s something special about teenage dreams. It’s a time in your life when you’re looking forward, so much is unsettled. Teens can dream big about becoming (often in quite a random way) someone who inhabits an extraordinary life – the ordinary teenager who turns out to be a princess (the Meg Cabot books tapping brilliantly into that classic fantasy), the gangly, nerdy girl who suddenly finds herself as the face of an international modelling campaign (Geek Girl of course), the teenager who one minute is ‘acting’ a carrot and the next is in the running for a big role in a dystopian movie (our Waiting for Callback books). And you can dream about doing the ordinary teenage things (like first love) in an extraordinary way. We can write and you can read a dreamy love interest and have it all work out – Honor won’t let me write these scenes because of the cringe factor and (sadly) she’s the first to admit that Archie, the ‘practically perfect’ love interest in our books isn’t 100% drawn from real-life observance of her male peers… Blame it on Darcy. Maybe the dream is just not messing up and turning up to a Halloween party dressed as an olive. We’ve all been there. Our books and lots of my favourites combine the downright weird with the weirdly recognisable. I’m not suggesting that children and YA books shouldn’t get stuck in to real issues and problems – there is so much good and gritty writing out there. You can like Angus, Thongs and Perfect Snogging and Louise O’Neill’s Asking for It hard hitting books. I do. And one of the best bits about writing ‘dreams come true’ books is showing that even when things are special they’re not usually perfect (the film that Elektra, our lead character, is cast in, ends up being pretty dystopian off as well as on-camera) - even the most lusted after lives have their ups and downs. One of the Waiting for Callback inspirations was Honor’s brief experience as a ‘professional’ kid actor. She had the big agent, she had multiple call backs, the big break never came but some of the things that happened and people she met were just hilarious - the least credible scene in Waiting for Callback (it involves a case of mistaken identity, a film set and a famous actor) is loosely based on something that actually happened to her. Often the funniest scenes in ‘dreams come true’ books are when the dream is going a bit wonky. Writing about teens with dreams is a joy. Even when we’re throwing obstacles in their way, we’re rooting for our characters and our biggest author dream? That our books, with their light humorous escapism, cheer up some teens on the days when real teenage life just isn’t delivering. The Waiting for Callback series is published by Simon and Schuster - find out more here. 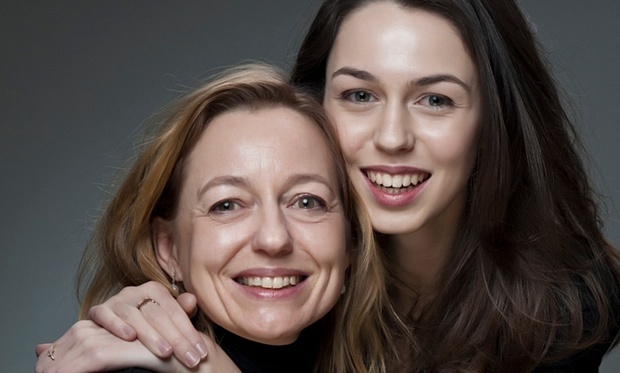 BIO: Perdita Cargill is a former barrister and her eighteen-year-old daughter Honor is currently studying at Oxford. Honor herself has dipped her toe into the world of acting, giving them some unforgettable experiences to draw on for the WAITING FOR CALLBACK series.